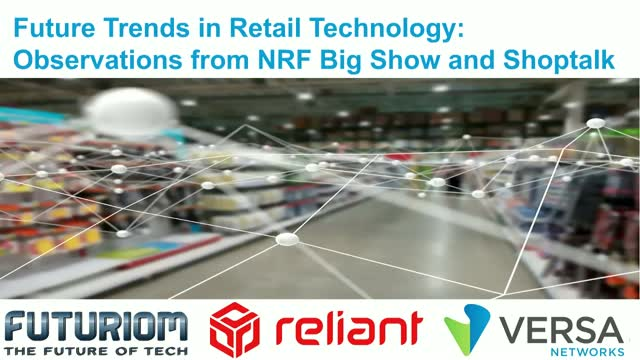 Coming on the heels of the conclusion of Shoptalk 2019, join Atchison Frazer, CMO of Versa Networks and Richard Newman, CTO of Reliant Solutions (the leading providing of an edge computing solution) as they discuss the latest technology and retail trends that were highlighted at both Shoptalk and the NRF Big Show held in January. This will be a moderated discussion hosted by Scott Raynovich, Principal Analyst at Futuriom. Others may take your network for granted–but you can’t afford to. Somehow, you have to connect your business to a growing number of cloud and SaaS providers while providing strong security and fulfilling high service-level expectations for a growing number of diverse applications. Join Verizon VP of Network and Security Product Management, Vickie Lonker, with Versa Networks Director of Marketing, Rob McBride, and Verizon Sr. Product Manager, Anuj Dutia, for a discussion on the future of your multi-site network. Junte-se a nós para aprender o básico de SD-WAN neste webinar. Saiba o que é SD-WAN, por que você precisa de SD-WAN e como esta tecnologia baseada em SDN é a nova arquitetura fundamental na era multi-cloud e digital. A WAN definida por software está transformando radicalmente todas as indústrias, mudando fundamentalmente a maneira como as empresas e os provedores de serviços estão arquitetando suas WANs. A WAN definida por software traz novos conceitos e tecnologias que provedores de serviços (CSP) e empresas precisam entender quando começam a avaliar e implantar essa WAN de nova geração em sites remotos. Este webinar será realizado em Português. Whether using an on-premises or cloud based UC solution, reliable and SLA driven connectivity is critical to ensure that your enterprise business productivity and presence is not impacted. Join Versa Networks and S-NET Communications as we provide insights into how a software-defined WAN (SD-WAN) delivers the improved and reliable secure connectivity for your enterprise voice and video services. S-NET Communications is an industry expert in cloud communications solutions, removing complexity from IT and enabling enterprises and SMBs to collaborate and connect from any location and any device. Learn from their experience in integrating SD-WAN into their portfolio to deliver more secure and reliable services so their customers can attain faster data transfers and a more positive user experience for their business voice services. In this joint webinar, Versa Networks and VergX will discuss the benefits of a Network-as-a-Service approach to SD-WAN and SD-Security. SD-WAN and SD-Security are hitting the mainstream market – and with Garter predicting that “by 2020, more than 50% of WAN edge infrastructure refreshes will be based on SD-WAN” and IDC forecasting SD-WAN to be a “$6 billion market,” by 2020, every service provider and enterprise should have WAN transformation on their radar. With many services now being offered in a as-a-Service (XaaS) format, service providers need to take a deep look at how their customers are managing and refreshing their WAN technologies – the Versa NaaS format for providing SD-WAN and SD-Security is both a digestible and managed approach, and offers unique advantages for UCaaS companies looking to expand and improve the experience their services provide. Learn how SD-WAN and SD-Security can seamlessly fit into an existing product and services portfolio without the infrastructure investment and lost time to market. In this joint webinar, Versa Networks and S-NET will discuss and compare the benefits of both a DIY SD-WAN and Managed SD-WAN approach. Enterprises rely on the WAN for connectivity between branches, data centers and clouds. The complexity of the WAN has grown and with-it management and operations. Many enterprise businesses look to SD-WAN to solve their connectivity and complexity woes. Is the simplicity and automation that comes with SD-WAN enough to reduce the current complexity many enterprise IT operators are facing? With many services now being offered as-a-Service (XaaS) the thought of moving WAN management to a managed services model is being evaluated for enterprise businesses across all verticals. Guest Wi-Fi services, partner networks and multi-tenancy all are drivers to segment the branch and WAN infrastructure to secure and prevent unauthorized access of corporate assets. However, what is segmentation when it comes to the next-generation branch architecture and SD-WAN? Is it really only VLANs and encrypted traffic? Direct Internet access (DIA) increases the exposure of the enterprise branch and WAN, requiring IT to deploy next-generation security beyond just the data center. SD-WAN provides secure connectivity between sites but can it adequately protect the branch with just a stateful firewall? Malware, ransomware, viruses and DDOS attacks are on the rise and impacting businesses globally. How can IT deploy advanced branch security with SD-WAN without compromising on performance, security and cost? Software-defining the WAN is just one component to simplifying and cost reducing the enterprise branch. But why limit your transformation to just the WAN? Are you aware of the additional appliance and service consolidation that you can achieve when you look beyond just WAN connectivity? Have you considered the implications of security when it comes to direct Internet access (DIA), and the complexity that it can add? Join us for this live webinar as we discuss how a software-defined branch (SD-Branch) is the logical step in your WAN/branch transformation. The WAN, branch networking and security landscape is evolving rapidly and disrupting how you architect and provide services to your users. Attend our events to understand more about software-defining your security, WAN and branch to enable a faster business transformation in the digital and cloud age. Versa’s mission is to address the primary operational and business challenges that enterprises and service providers are facing with legacy WANs and traditional networking hardware, and deliver the full promise of software-based networking and security. Versa is unique among software-defined networking vendors, providing an end-to-end solution that both simplifies and secures the WAN/branch office network.